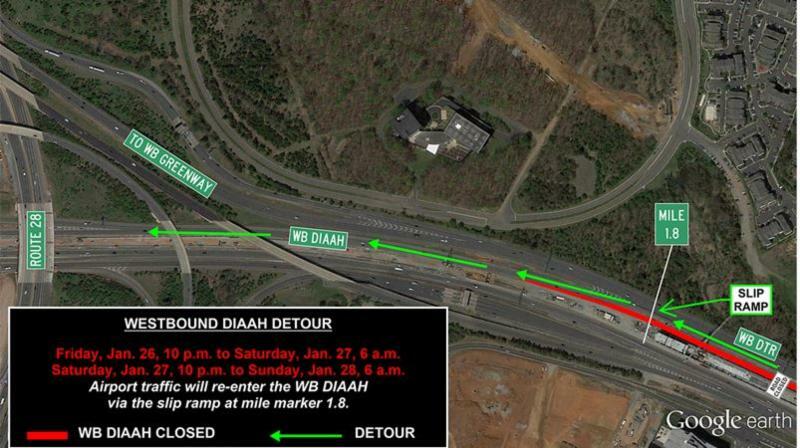 Overnight Detour for Westbound Dulles International Airport Access Highway Friday, Jan. 26 – Saturday, Jan. 27, 10 p.m. to 6 a.m. Saturday, Jan. 27 – Sunday, Jan. 28, 10 p.m. to 6 a.m.
Friday, Jan. 26 - Saturday, Jan. 27, 10 p.m. to 6 a.m.
Saturday, Jan. 27 - Sunday, Jan. 28, 10 p.m. to 6 a.m.
On Friday, Jan. 26 - Sunday, Jan. 28, from 10 p.m. to 6 a.m. each night, drivers using the westbound Dulles International Airport Access Highway (DIAAH) will experience a detour to the westbound Dulles Toll Road between Beulah Road and Route 28 while Dulles Corridor Metrorail Project crews continue the construction of the Innovation Center Metrorail Station in the median of the DIAAH. This detour is dependent upon wind and weather advisories. See details below and on the next page. All work is wind and weather dependent and subject to change.